Why does Central Registrar miss NCUI meetings? One of the Governing Council Members of the national apex cooperative body NCUI, who asked not to be identified by name has blasted the government in the wake of media report that guidelines of Corpus Fund were flouted. Where are Central Registrar and Additional Secretary when a meeting takes place? He asked thereby underlining the fact that IAS officials hardly bother to attend important cooperative meetings and are happy sending midgets for the job. “It has been our repeated experience that Central Registrar and other officials would find one excuse or the other to avoid cooperative meetings”, the GC member added. Readers would recall that the Corpus Fund Committee consists of NCUI President, Chief Executive, NCCT secretary – the latter as the member-secretary, Financial Advisor, GOI, Central Registrar, a representative of NCDC and a government nominated Director. It is obvious that the govt has majority of members on the Committee, he pointed out. Earlier, a media report accused NCCT and NCUI of flouting the norms in managing corpus fund of Rs 340 crore. The paper says the government is considering actions against the national council for cooperative training (NCCT) management. The GC member also clarified that any decision taken in the Committee does not come to the Governing Council and as such we have no idea about this. “But having been in the NCUI for past 20 years I can tell you the way IAS officials treat the apex body”, he added. 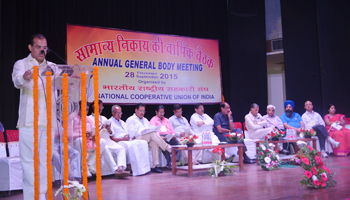 It is usually seen that IAS officers are made MDs of national cooperative bodies such as NAFED, NCCF and others. They are given additional charge with their main job still revolving around the ministry. In many cases, cooperative files keep filing for weeks with the elected bodies just feeling helpless. And it is here that the GC member has made a valid point, echoed several cooperators Indian Cooperative talked to.